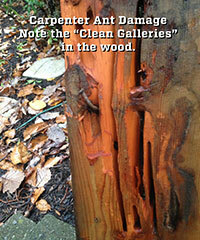 Carpenter ants can cause dramatic damage to organic materials, such as carving deep "galleries" in wood. In New Jersey, carpenter ants become active in May and slow down in October with July is the month of peak activity. 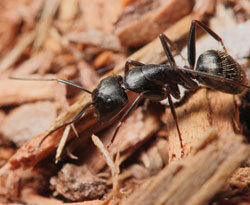 If carpenter ants emerge during the winter or early spring, an interior nest is likely. Otherwise, during peak season, the ants may only be scouts from an outside nest. 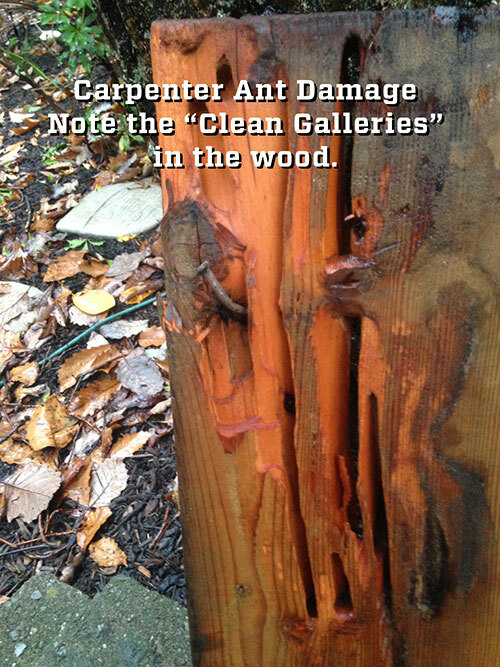 Homes built in wooded lots are prime targets for carpenter ant infestations. Carpenter ants are found in most urban shade trees and they can forage up to 100 yards to search for food – and that can include a home that offers food and moisture. These foraging worker ants often establish satellite colonies apart from the parent colony around or inside a home. Homeowners should not only monitor the inside of their house for carpenter ant activity, but also the surrounding trees and other wood sources around the house to keep track of potential problems. The objective is to not get carpenter ants off your property. The outside trees are their natural habitat. The pest control objective is to keep the carpenter ants outside of your home. Carpenter ants are exceptionally large ants with a uniform dull black color. The worker ants can range in size up to a half-inch. Like all insects, carpenter ants have six legs and three body segments, a head, trunk (thorax), and abdomen. Their trunk is “hunchback”-shaped when viewed from the side. Its body is covered with a tough, shell-like exoskeleton. All six legs are connected to the trunk. The antennae, or feelers, are used for communication, smell, touch, and taste. Carpenter ants have strong jaws with pinchers enabling them to chew on wood. The larger workers can deliver a nasty bite, but unlike other types of ants such as fire ants, they don’t carry a poison sack and stinger. Also, unlike ticks or mosquitoes, carpenter ants are not vectors or carriers of any disease. 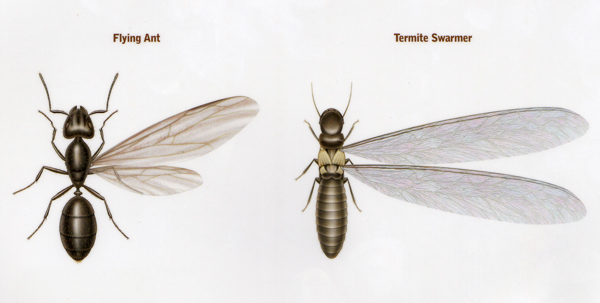 What's the difference between winged carpenter ants and winged termites? What can Cowleys Pest Services do for homeowners to remove a carpenter ant infestation? Eliminating a carpenter ant infestation can be a difficult and challenging task. Often, the nests are often concealed in wall voids, ceilings, subfloors, attics or hollow doors. The top pest control services implement Integrated Pest Management (IPM) protocols that emphasize prevention and the judicious and selective use of chemical applications as part of an overall cost-effective long-term treatment plan. The pest control professional must inspect the structure to determine where there are nests inside the structure as well as the points of entry from outside nests. It is important to identify the species of carpenter ants causing the problem, to find the nests – both inside the structure as well outside. The nest must be located and removed. Anything else is ineffective. Although it may “feel good” to kill a few of the pesky ants, spraying a home-use insecticide on surfaces where ants travel or congregate such as along baseboards or in holes or cracks in the walls and floors has little long-term effect. It may reduce the frequency and number of ants that you see, but is completely ineffective in eliminating the nest. Carpenter ants live in large, complex colonies. There is one queen who does the egg laying and thousands of workers with special functions. Some care for the eggs, larvae, and pupae in the nest, others guard the nest, some dig out the nest, and others forage for food to bring back to the nest. The workers are sterile – they can’t mate and lay eggs. The ants are so closely related and interdependent that an ant colony, from the perspective of a pest control professional, is the equivalent of a single creature. No one ant or group of ants matter. There are literally thousands of them. A carpenter ant infestation can only be eradicated if the colony is destroyed and the queen is killed. Simply killing the foraging ants is an ineffective short-term solution. Also, once the nest is located and destroyed, the environment for possible re-infestation must be removed. That means replacing the damaged or decayed wood that served as their nest and eliminating moisture problems. A pest control professional who follows Integrated Pest Management (IPM) protocols can cost-effectively remove the infestation and, more importantly, minimize the chances of a subsequent re-infestation. Nonchemical techniques, such as exclusion and habitat modification, that are combined with strategic applications is the most effective way to rid a home of carpenter ants. The particular treatments vary depending on the nature and severity of the infestation. A full application consists of applications to wall voids as well as a perimeter spray. A spot treatment may be used for a new or localized infestation. Satellite nests must be eliminated as well because the workers can survive even if their parent colony is destroyed. Dusts are effective for wall voids. Baits can be an effective carpenter ants control measure for carpenter ants because of the ants’ food-sharing behaviors. Other controls must be implemented as well. If you suspect a carpenter ant infestation in your home, call the pest control specialists at Cowleys Pest Services. They'll inspect the problem at hand and provide you with long-term solutions. Cowleys Pest Services proudly serves homeowners in Mercer, Ocean, Monmouth, Middlesex County, including Woodbridge, Edison, Lakewood and the surrounding area.